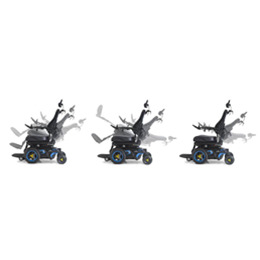 The F3 CORPUS offers the smallest footprint of this redesigned series of front-wheel drive power wheelchairs. Its size and agility let users move quickly in and out of tight spaces like busy city streets and crowded areas like malls...or even parties. The platform has a lower, repositioned center of gravity, which greatly improves stability while traversing inclines or declines. With its fully independent suspension, the F3 provides a comfortable ride and allows users to navigate the obstacles of life.